OB-GYN Women’s Centre of Lakewood Ranch is proud to have our newest member, Physician Assistant Therese E. Goode, on the team! As our PA-C, Therese is dedicated to providing excellent healthcare for all women in the Lakewood Ranch Area. Growing up on Long Island, New York, Therese was exposed to the medical profession early on. Therese’s mother was a registered nurse who worked in the operating rooms, the newborn nursery and as a school nurse. Her mother would help out family members, friends and neighbors with medical problems, showing Therese how rewarding a healthcare career could be. Seeing her mother as she enjoyed helping others though her work as a nurse set Therese on her path to the healthcare profession. Eventually, Therese made the move down to beautiful Florida! After more than 20 years working as a Registered Respiratory Therapist, she enrolled in Physician’s Assistant school at the University of Florida. After graduating and passing the PA boards, she worked in primary care for few years. However, Therese found her true calling in OB-GYN. For seven years, Therese worked at Manatee County Rural Health before moving to OB-GYN Women’s Centre of Lakewood Ranch. What Therese loves most about working at OB-GYN Women’s Centre of Lakewood Ranch is that it gives her the chance to help women live healthier lives! 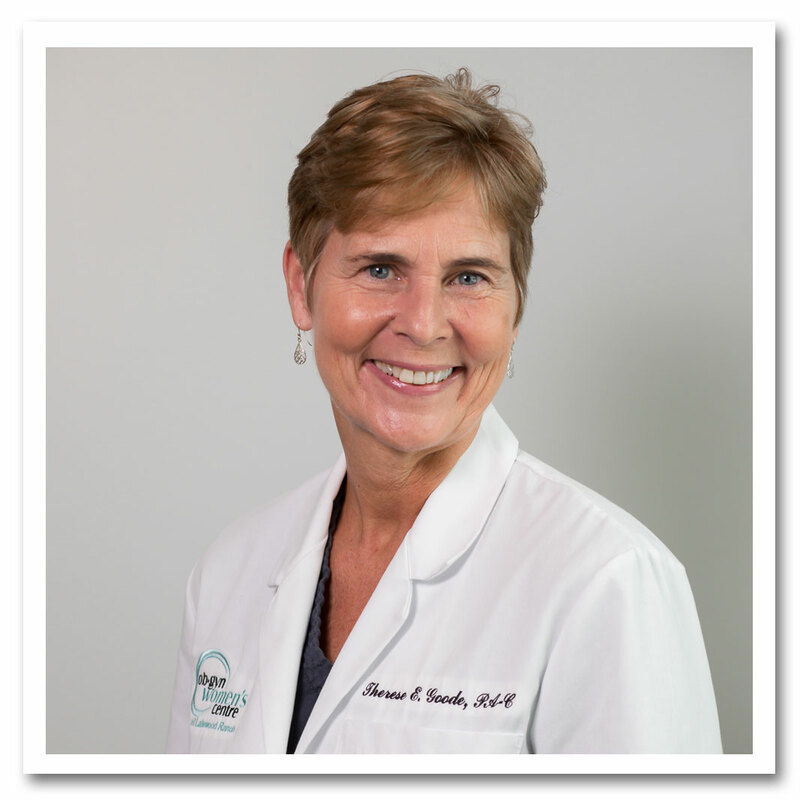 She enjoys the challenge of working with patients to resolve gynecological problems. Therese truly loves participating in the journey of pregnancy, from the positive pregnancy test to the last prenatal visit. For her, there is nothing more rewarding than seeing Moms, Dads and babies on postpartum rounds at the hospital and back in the office at the 6-week check up. As a provider of women’s healthcare, Therese is a part of all phases of pregnancy care. In her free time, Therese enjoys a variety of activities. She loves to golf, hike, exercise and travel. She also loves spending times with her friends and family. Come by OB-GYN Women’s Centre of Lakewood Ranch to see Therese or any of our other wonderful healthcare professionals. Just visit our patient request form, or give us a call at (941) 254-2717. We can’t wait to hear from you!